Your tour guide will pick you up at the lobby of your hotel around 8:00. There will be 4 to 6 members in your tour group. Your car will be a business-class car equipped with an air purifier, which will provide you with enough space and fresh air. Zhouzhuang has a history of over 1000 years. It will be a great experience to learn of the abundant history and culture of water town in Zhouzhuang. Zhouzhuang features not only the water town views but also the ancient houses. Most ancient houses in Zhouahuang were owned by rich merchants. Zhang House, Shen House and Ye Chucang’s Former Residence are the essence of these ancient houses. Zhang House has a history of over 500 years. Its former owner used materials with very high quality to build the house, so it is preserved very well now. Your tour guide will tell you the history and anecdotes about the house during your visit. There are over 100 rooms in the Shen House. While you are walking and admiring the ancient furniture and gardens in the Shen House, your thought will go back to the 18th century. Ye Chucang (1887-1946 AD) was a revolutionary at the end of Qing Dynasty (1636-1932 AD). His former residence is not so luxury as Shen and Zhang Houses, but you can feel the deep culture of his family. You guide will find a restaurant beside a river. Both river view and food will let you refresh in a short time. 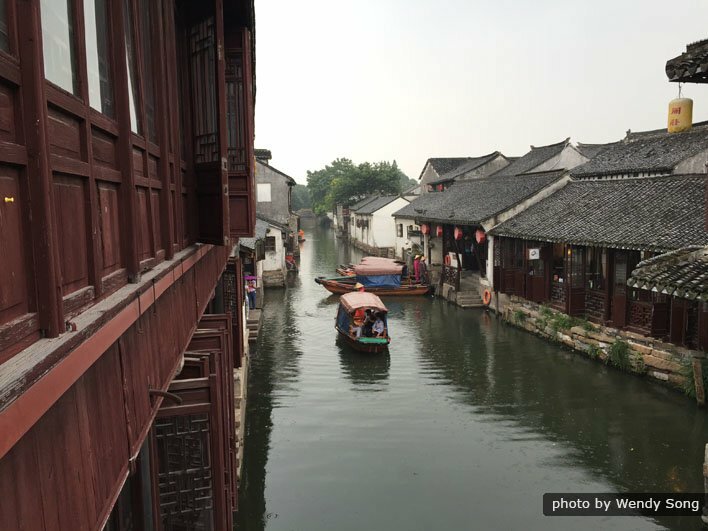 It takes around one hour to drive from Zhouzhuang to Jinxi, a water town with a history of over 2000 years. Jinxi Water Town enjoys a reputation of the “Home of Unofficial Museums”. Over 6 museums are located in the small town, such as a tile museum, a ceramic museum and a root carving museum. These museums are all included in your tour. Besides museums, there are also many ancient bridges, where you can take beautiful photos. After the tour, you will be transferred to your hotel in Shanghai, or the airport or train station where you can catch your plane or train to your next destination. The price of this tour will rise during the China National Day holiday (September 30th to October 7th) and Chinese New Year holiday (late January or early February). Usually the group number will be 10 people or more than that during peak seasons. However, for tour title which is labelled with "small group tours" in Shanghai, you will travel with a small group with 4 to 6 members. The local English-speaking guide and a business-class car will serve your group only.